Set oven on 500° or “Broil.” Cook livers 5 minutes on one side; turn, sprinkle with minced dry onion and broil 3 minutes more; cool. Put livers, onions and eggs through a food mill; add pan juices and blend. If additional liquid is needed, add chicken bouillon. Season with salt and pepper. Sprinkle gelatin over cold water in a small saucepan. Over low heat, stir constantly until gelatin dissolves – about 3 minutes. 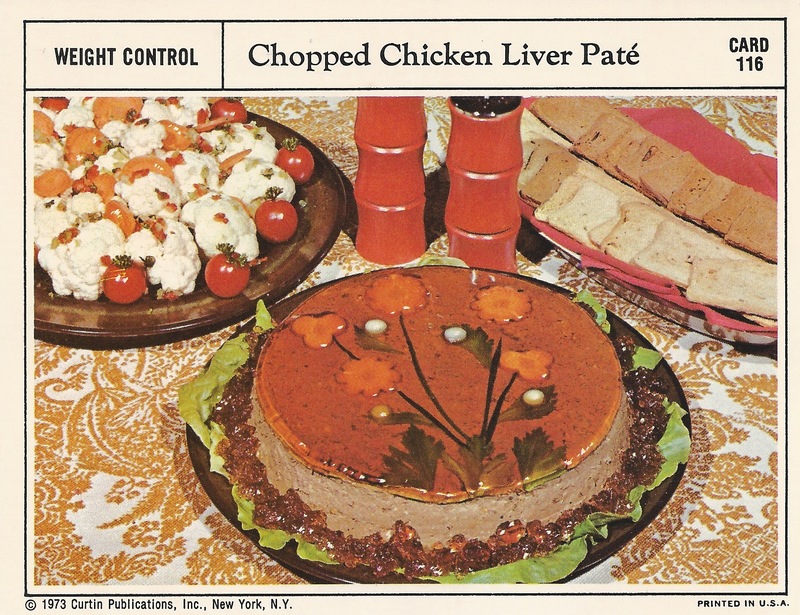 Remove from heat; add beef bouillon, pour a 1/4-inch layer of the aspic in an 8-inch round pan and chill until slightly jelled – about 5 minutes; place garnish of carrot and green onion slices, celery leaves on aspic; chill 10 minutes longer. Then mold chopped live on top of aspic – reserving balance of aspic. To serve: place pan in a dish of hot water for 5 seconds and unmold. Whip reserved aspic and decorate around the mold.